Box Dimensions (LxWxH) 3.15 x 2.2 x 1.4"
EN-EL15b Rechargeable Lithium-Ion Battery is rated 4.1 out of 5 by 7. Rated 4 out of 5 by ROBERT from Not just for Z6 or Z7? I went to my local camera store searching for a back up battery for my new D850. I picked this out and took it to the counter to pay and asked (just to make sure) if this was indeed for the Nikon D850. she went to confer with a co-worker and they both said yes. I went back to my car and immediately put it in my camera and , low and behold, it did work just fine. My older batteries form my D810 were giving my fits for some reason so that is why i went hunting for this. When I got home and looked this up it said it was for the Z6 or Z7. I dont think that it is JUST for those cameras. I havent had enough time to see how long it lasts while taking photos and video, but i plan on putting it through the wringer tonite during karate class. Rated 4 out of 5 by Stephen from Z6 and video recording long jobs now not a concern. I was asked to record a 2:15 school show and I wanted to see how my Nikon Z6 would perform with my Atomos Ninja Assassin recorder. With two batteries for each device, I was able to swap batteries at intermission and capture everything on battery power with time to spare. Im glad I have enough juice now to go out and shoot both stills and video and only be concerned about XQD storage until the next (affordable) memory card option for the Z-series cameras will arrive on the market.. Rated 4 out of 5 by John from Updated Battery Its the latest EN-EL15 update, and works as advertised. What else would you expect from Nikon? Rated 4 out of 5 by CHRISTOPHER from A little overpriced but does the job A little overpriced in my opinion, but actually it seems a little cheaper than the 15A, at least when I last got a 15A I think it was $70. Anyway, these should also work in cameras that use 15A. (And 15A does work in a Z6/Z7 but supposedly you dont get as many shots with them, although I cannot see a difference in the specs but someone had said the circuitry is a bit different I guess). Rated 5 out of 5 by Oscar A from Fully compatible with Nikon D7000 camera Got this as a replacement battery for my Nikon D7000 camera. It works well with my original Nikon Charger MH-25. Very satisfied with this battery EN-EL15b. Thank you! Can this battery be used in the D850? Yes it can be. 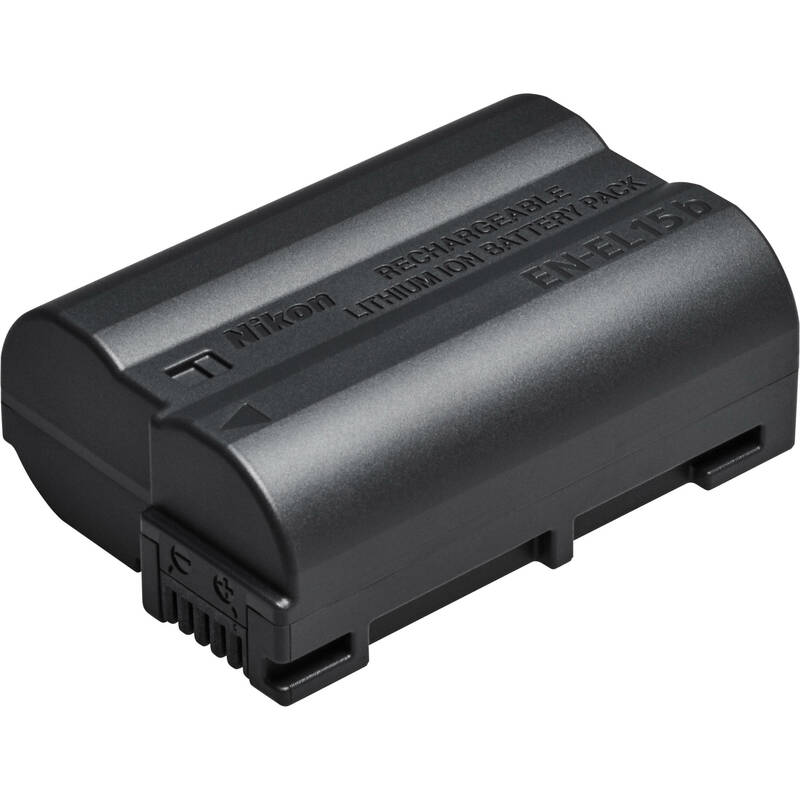 This battery is compatible with the Nikon D850. Is this battery backwards compatible with older models that take EN-EL-15's, like the D850 and D500 etc... Also what is the MaH Rating? Got my Z6 with this battery. Same rating as EN-EL15: 7v 1900mAH 14Wh and they both work with my D750 and Z6 and vise versa. Charger came with Z6 and D750 are same model MH-25a. what is the difference between the Nikon EN-EL15b and the Nikon EN-EL15a? EN-EL15b was introduced together with Nikon Z7 and Z6. The biggest difference is that you can charge EN-EL15b via USB while inside the Z7 &amp; Z6 when the camera is off. Is it necessary to get el15b (or en el15a can also do that) in order to get charge through &quot;usb charging&quot; to Z6/Z7? Can this battery be used in the Nikon D850? It worked with my D750 and Z6.